Every time I lunch at my favorite neighbor restaurant Il Buco Alimentari & Vineria I go with a plan to order what I loved on the last visit and invariably am tempted instead by the latest addition to the menu. Fortunately, the bread basket is always available along with excellent olive oil but if butter is requested it is my favorite from Vermont Butter & Cheese. 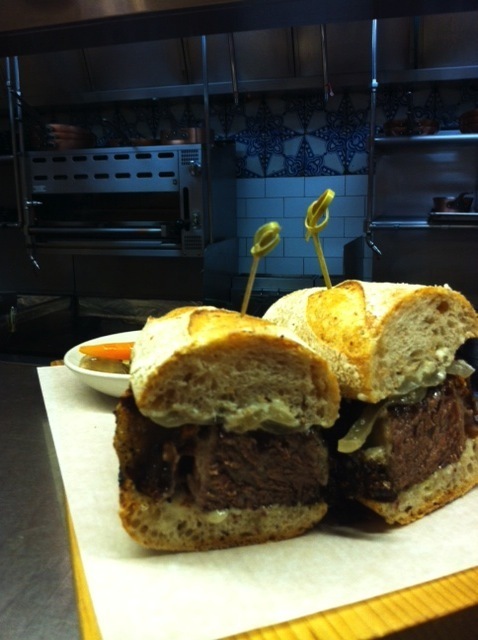 Last week my friend David ordered the short rib panini. I suggested not to as the sandwiches are huge and enough for two, but boy am I glad he ignored my advice, generously sharing the delectable sandwich with his mom (visiting from Los Vegas) and me. These were the best short ribs I've ever tasted. They were amazingly flavorful, moist, with a slightly gelatinous quality so prized from this cut of meat, but the tops were peppery and crunchy. David must love me as he handed over the last piece, and I loved this dish so much I didn't protest. The ribs were accompanied by an assortment of miniature pickled vegetables, perfect for offsetting the richness of the ribs. When we asked manager Danny Freeman how the short ribs were cooked, he explained that they were brined in a honey and spice brine for 50 hours before roasting covered. To create the crunchy topping, a cast iron pan was heated on the cooktop, the pepper spice mixture added, the short ribs set on top, and then returned to a very hot oven to crisp. Danny also sent out an octopus starter--another item we never would have ordered as usually it is tough. Not this one--it was my favorite thing of our lunch--well at least it was on par with the short ribs! We did order one dessert--the deliciously smooth and creamy chocolate budino. It came with a very thin sliver of chocolate cookie with a most intriguing flavor that turned out to be Calabrian chili powder. Needless to say, none of us ate dinner that night.